A town centre church hall was the chosen venue and with the usual AGM reports on the agenda it was easy to catch up on the year’s activities, trips and functions. Coffee mornings in local venues are a regular feature - good news for Harrow coffee shops that provide gluten free cakes and snacks! The availability of fish and chips in the borough was hotly debated with differing experiences on the issues of cross contamination and confidence in staff knowledge. Both of these are key to deciding whether or not to eat in a restaurant or buy from a take away and are amongst the reasons why Awkward Eaters was developed so I listened carefully to the comments and questions. Awkwardeaters.com will be contacting the recommended venues with an invitation to sign up and promote their commitment to catering to the needs of visitors and those in the area in search of gluten free options. The age range of those in attendance at the meeting varied from early twenties to eighties, but many were probably approaching retirement age if not already there. I was struck by how many of them had lived their lives without the current advantages of the World Wide Web with its instant access to a wealth of helpful information. Some will have shopped, cooked and eaten for much of their lives without the present day increased and ever-growing availability of specialist foods and without our current labelling regulations. I couldn’t help but think that there was more knowledge and experience of life on a gluten free diet in this church hall than I’d probably ever come across in one place before! The meeting included a couple of specially invited guests from the world of gluten free products – one from a very new and small company to the market and one from a long established brand that most coeliacs will have included within their prescription foods if not from the local supermarket and health food store. The owner of newly established Soft Sage had brought along samples of their gluten free dough balls in several flavours. The lady sitting next to me was at first perplexed and wanted to know what a dough ball was. When I explained she replied ‘That doesn’t sound very nice!’ Strange because I thought I was selling them quite well! I knew that the cheese variety would be off limits to me, but I wanted to know if the garlic versions were dairy free and asked the guy from the company who was handing them round. After being told twice that there was no milk or milk products in them I still wasn’t convinced. So, with my better safe than sorry tenacity, before popping one of the delicious smelling samples into my mouth I checked again, this time asking the lady who seemed to be the company MD . ‘Definitely NOT dairy free, including the garlic ones’ was her response. I handed the dough ball back, feeling slightly tortured and reminded that when it comes to food contents, if in doubt keep asking. If you think it may well contain a certain ingredient, it probably does! I should report that everyone around me seemed to be really enjoying their dough balls and all the samples quickly disappeared. Next on the agenda was a promotional talk by Ayshea Bliss of Glutafin. Starting with a brief history of the company that owns Glutafin and other gluten free product brands, Ayshea also included the personal journey that had led her to the work she does. As someone with a long-standing diagnosis of coeliac disease, Ayshea has real experience and understanding of the dietary demons associated with following a gluten free diet. Naturally she had come armed with samples to taste and to take home. I needed a couple of minutes to get to grips with the contents table for the Glutafin products, but once mastered I was ready to taste the samples and as some of the suitable bread samples were ‘buttered’ with Pure margarine I didn’t go hungry this time. I have to say this was a very interesting and pleasant way to spend a Saturday afternoon and gave me a real insight into the work being done by countless groups throughout the length and breadth of the UK. There were however two distinct highlights for me. I met many interesting and lovely people, but without a doubt the most memorable was a delightful elderly care home resident. 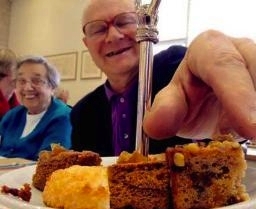 Her experiences with staff at the home and her lack of confidence in their understanding of her condition was very sobering and has prompted me to look into the provision of suitable foods in care homes further. How scary it must be to feel that she is being labelled as difficult (in fact an awkward eater) by those who are responsible for providing all of her meals. If ever there is a need for education and understanding of coeliac disease and other dietary restrictions it must surely be in institutions where food availability and choice is limited and where reliance on the caregivers is total. And the second highlight? Having three winning tickets drawn in the raffle! I happily had two of them re-drawn, but I did go home with a lovely cookery book – gluten free of course! The Harrow group holds its coffee mornings on the first Tuesday of every month and are currently looking forward to enjoying afternoon tea at the Barn Hotel in Ruislip on May 15th. Booking is essential – for more information email harrow@coeliac.org.uk. You can join Coeliac UK* here www.coeliac.org.uk. You can also expect to hear more information about the group’s activities if you follow their tweets as they have recently joined the twittering classes at @Harrow_Coeliac. Do please give them a follow to show your support for this small group of people working hard to make life better for their fellow coeliac's.